18 November 2018 In a glass-panelled room of the Haus der Architektur in Graz, Austria, exists a fictional furniture showroom from a dramatically reimagined year 1990 – in this particular historical timeline, Austria has joined up with the reunification of Germany, and instead of military parades we have endlessly replicated furniture stores. Cold steel and glass objects meet in flashy postmodern reconstructions: clocks melt of tables, giant hair clips tie together curtains, and miniature tasselled couches double up as tissue boxes. ‘Here,’ writes the artist Henrike Naumann, ‘hedonistic self-optimisation and radical right-wing politics intertwine, taking on truly malignant proportions.’ In this work, Anschluss ’90, 2018, Naumann creates a kitschy pastel landscape to play out the dissonances of the German reunification through which she grew up. In 1990, the slogan ‘We are the people’ turned into ‘We are one people’, and to Naumann, who was born in Zwickau, an East German town, this was an implausible premise, and one that has remained a fiction to this day. The aesthetic of Anschluss ’90 is kept sharp, styled in a manner that has little whimsy but total polish. The installation forms a part of the Steirischer Herbst Festival 2018, an edition that is titled ‘Volksfronten’ (The People’s Front) as both a rebuke and a reclamation of the phrase’s historical connotations. ‘I am not exactly an optimist, but I am curious to know what happens when we reject disappointment as a strategy,’ said Ewa Majewska, of the Artes Liberales department at the University of Warsaw, at the ‘Our Little Fascisms’ debates held during the second week of the festival. ‘Only those that don’t fight oppression on a daily basis can indulge in a melancholic nostalgia … Those that are oppressed fall and then have to get back up again.’ Majewska proposed ‘weak resistance’ as a strategy against the global rise of fascism, where failing and collapsing are markers of a ‘progressive struggle’. Part of this ‘weak resistance’ is in the building of networks of solidarity between care workers. ‘Care labour is crucial for societies’, she said, ‘and it is not a heroic strategy, because we don’t need heroes any more.’ Artist Funda Gül Özcan, too, is wary of heroism. In it happened as expected, 2018, an immersive installation in what used to be the Ankara Türkü Bar in Graz, we are given a hologram of a snivelling Recep Tip Erdoğan, who repeatedly cries out in a wailing voice that fills up the space: ‘I’m so soooryy…’ The hologram imagines Erdoğan giving a farcical and pathetic apology to his former ally, the exiled businessman and religious leader Fethullah Gülen. It is reminiscent of a night in 2016 when Erdoğan appeared on live television through FaceTime, rallying his supporters to discredit Gülen’s allegations of corruption against Erdoğan’s and to take to the streets to defend Erdoğan’s claim to power. ‘Crocodile tears are an indispensable element in the new authoritarian cults’, says the artist, as the sound of Erdoğan’s wails is tenderly drowned out by a cover of Rihanna’s ‘Diamonds’. Elsewhere in the city, opposite a threestorey Swarowski flagship store with baroque plaster detailing, stands a tall black bin with a sign painted on its side that reads, in German: ‘Are you tormented by the uniform of your Nazi-uncle that is still in the attic? “Where to go?” You ask yourself? Selling too embarrassing, burning too painful? Then I have THE solution for you!’ The bin, shaped like the recycling bins that urge us to throw in old clothes or used batteries, asks for old Nazi memorabilia instead, and being as we are in Austria, assumes that there is much of it still occupying the homes (and minds) of the city’s residents. 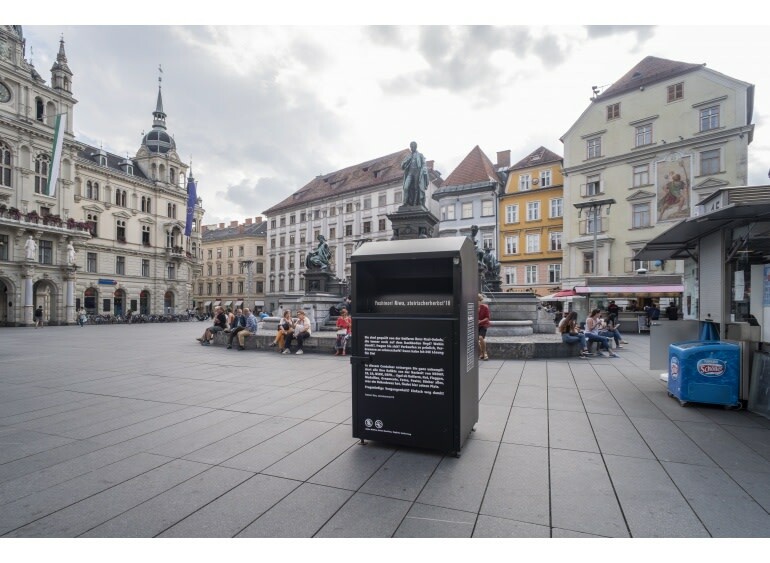 The bin forms part of Withdrawing Adolf Hitler from a Private Space, 2018, a work by Vienna-based Japanese artist Yoshinori Niwa for the festival. The artist personally oversees the bin being emptied out each evening, its contents documented and then destroyed. ‘A woman carried a large portrait of Hitler over on the bus the other day,’ another writer tells me as he walks me to the site, ‘she said it was an act of protest.’ He also points to a large dent across the bin where someone has tried to break it open. I find that my own curiosity is piqued much in the same way – I am desperate to know what is inside. The bin has a bewitching effect, tugging at a voyeuristic curiosity about the spectacle of bringing a private shame to closure in public. As I walk away, I imagine the woman puling at the handles to slip in a large painting of the most famous fascist leader in history, while passersby avert their gaze from her ‘act of protest’. In some circles, averted eyes are a characteristic feature of conversations about fascisms – if you say the word, eyes quickly drop to the floor, a sign that the conversation has gone too far. According to Tobias Ginsburg, author of the new book The Journey into the Reich: Reich Citizens, ‘dopey eyes’ are a prominent feature of the secret rooms behind restaurants where large groups of neo-Nazi’s gather to discuss strategy. Ginsburg spent the better part of a year undercover among different neo-Nazi groups across Germany and Austria, particularly with Reichsbürger – ‘Reich Citizens’ – who reject the legitimacy of the German state and maintain that the Reich continues to exist according to its Second World War borders. ‘I have actually been to Graz before,’ Ginsburg says as he is called to stage at the Orpheum, one of the venues of the Steirischer Herbst. ‘Just a few streets down from here is the head ofice of a neo-Nazi publisher where I was once at a meeting about the potential prison break of two neo-Nazi felons still in custody … There was a serious plan to smuggle them out of the country.’ Himself a German Jew, Ginsburg says that he had to ‘suspend all systems of fear’ in order to push on with the task of blending in. Much like the bin that is an attempt to make public and prominent something that is shamefully hidden away in the proverbial attic, Ginsburg’s book makes the argument that members of neo-Nazi groups are often completely ‘ordinary’ citizens, some of whom even occupy high positions in the German and Austrian governments. Ishay Landa, professor of history at the Open University of Israel, began the ‘Our Little Fascisms’ debates by explicitly setting the frame: to trace the history of fascism is to locate its roots in liberalism. The two are inextricably linked, best played out in their relationship to the economy, where both fascism and liberalism are preoccupied with the tensions of modernity: class struggle, nation building and war. The residents of Graz do not agree on their reaction to Niwa’s work: some see it as obscene, others as a silly reminder; many are opposed to the idea that the items are destroyed instead of being collated and kept in a museum. Skye Arundhati Thomas is a writer based in Mumbai. She is contributing editor at The White Review.